This document summarizes the application scenarios and business logic of private cloud, hosting, and public cloud to help users decide whether to purchase HUAWEI CLOUD services. Without knowing the total cost of ownership (TCO), enterprises will find it difficult to choose between public cloud, hosting, and private cloud for their IT deployment. This document uses web applications as an example to compare the business logic and TCO of the three modes. However, due to huge differences in construction mode, solution design, and service content, we cannot compare the three modes directly. This document is for your reference only. In practice, you need to analyze each mode based on your specific scenarios and requirements. Security: For security or privacy, data must be directly controlled and physically isolated. Availability: Certain resources (such as computing resources) cannot be obtained from shared resource pools. Reuse: Enterprises have previously constructed and purchased a large number of DCs and devices. Different service scenarios require different IT resources. The following uses typical web applications as an example to analyze the offering differences and TCO projections for each of the three modes. Service models have a significant impact on the TCO of web applications. The following figure provides different service models and server requirements for three typical service scenarios. Private cloud: Enterprises construct their own equipment rooms and purchase, deploy, and maintain software and hardware. In addition to CAPEX, they must invest heavily in professional IT teams. Hosting: Hosting providers bill for cabinets, bandwidth, and hardware yearly. They also provide basic O&M services, such as hardware maintenance. Enterprises must purchase software and set up IT teams for resource planning and management as well as platform O&M. Public cloud: Enterprises purchase cloud services on demand. They do not construct equipment rooms or purchase, deploy, or maintain software or hardware. Though apple-to-apple comparison is impossible, we know that computing and database resources account for most of an enterprise's TCO. In the following TCO model, other resources (such as load balancing, CDN, storage, and data transmission) are adjusted without affecting the overall TCO projections. Public cloud is the most economical mode for many service models. In stable-volume scenarios, public cloud reduces TCO by up to 66% compared to private cloud (with a 3-year package). In predictable-peak scenarios, public cloud reduces TCO by up to 75% (with a 3-year package and pay per use). 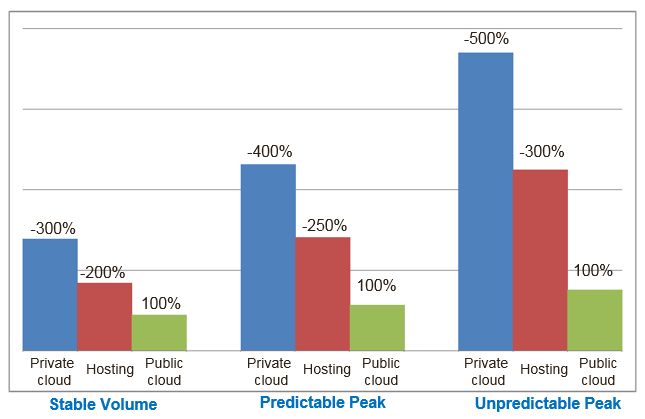 In unpredictable-peak scenarios, public cloud reduces TCO by up to 80% (with pay per use). Public cloud can accurately guide IT investment planning and management. Private cloud and hosting may incur excessive investment or insufficient investment. Excessive investment is a waste. Insufficient investment will affect performance and availability. Superior technologies: Moving from traditional physical machines to virtualization technologies, container technologies, and serverless computing, public cloud has driven the development of IT technologies. Technology development improves resource efficiency, enhances power consumption and space computing capabilities, and reduces IT costs. 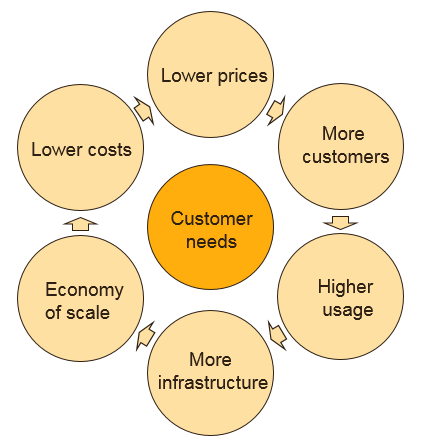 Economy of scale: Public cloud embraces the economy of scale, making IT resources more cost-effective. For example, the cost for using a super large DC (50,000 servers) is just 1/7 to 1/5 of the cost for using a medium-sized DC (1000 servers). Flexible purchase modes: If enterprises build their own DCs, the annual server usage is 5% to 20%. The use of public clouds can increase resource usage to nearly 100%. HUAWEI CLOUD provides discounts for yearly/monthly and batch packages and will soon integrate a TCO calculator to offer ideal IT investment planning solutions to customers. For details about how to best purchase cloud services, see Best Practices of Cost Optimization. Fast deployment: HUAWEI CLOUD automatic deployment tools accelerate system deployment from 40-70 hours to 30 minutes and reduce costs by 90%. HUAWEI will offer an undifferentiated platform (CloudOS), architecture, and APIs to global partners, including Deutsche Telekom and Orange S.A. Service rollout will be therefore accelerated. Efficient and automatic O&M: Combined with HUAWEI CLOUD's automatic O&M system, public clouds improve O&M efficiency hundreds of times over. The IT cloud migration pace and service requirements vary according to industry. Therefore, all three modes will coexist for a long time. The TCO advantages of public cloud will become more and more pronounced in the future as this mode continues to improve through a virtuous cycle.